This study is an examination of President Trump’s ability to guide the national conversation via Twitter by using his impact on traditional media (TV news and print journalism) as a barometer. The tag-search method was implemented to track media coverage on specific issues President Trump tweeted about. Coverage was examined in the 30 days prior to, and the 30 days after Trump’s tweet on a particular topic to create a before and after picture of coverage. Correlations between Trump tweets and media coverage were calculated for the entire 60 day period. The results indicate that @realDonaldTrump has a significant impact on traditional media coverage. In the vast majority of cases, President Trump’s first tweet on an issue preceded a dramatic spike in news coverage of that issue, with coverage increases as high as 17,900 percent. 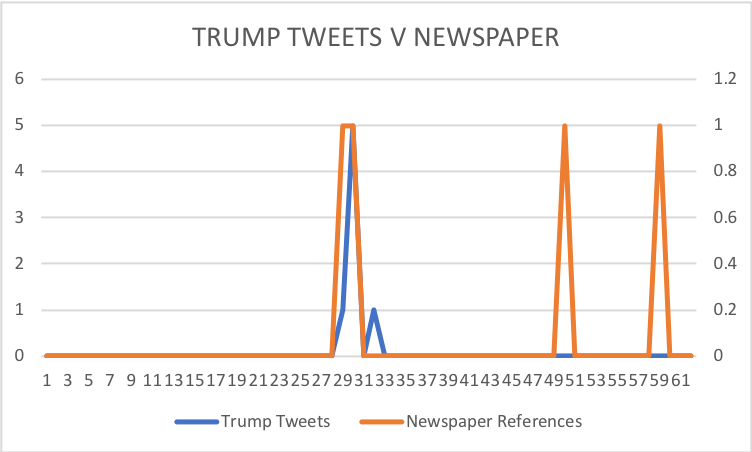 However, his ability to further instigate coverage after the tweet of origin appeared less significant with high correlations between Trump tweets and news coverage only being present in some instances. Nevertheless, it appears that President Trump’s Twitter is a powerful tool for which he can use to direct the national conversation, one tweet at a time. In the two-and-a-half centuries since America’s founding, the world has seen a staggering number of innovations. From Eli Whitney’s cotton gin, to Thomas Edison’s light bulb, to Steve Jobs’ iPhone, there is no shortage of technological advances that have dramatically altered the way Americans live their day-to-day lives. Naturally, these innovations have dramatically altered the presidency as well. The past century especially has seen radical advances in communications, transportation, and weapons technology, all of which have endowed the presidency with far greater powers than were initially envisioned for the office. The technology that has most profoundly impacted the presidency is one whose own impact can be tangibly measured: the nuclear weapon, a weapon capable of incredible destruction once consigned to the realm of science fiction. President Truman was the first and only president to use this power, and in fact, the only person in history to do so. The fact one person—the President—has it within their capacity to level cities with one action is awesome in the literal sense of the word. Modern transportation has also transformed the presidency. When the office was created, horses were the fastest form of transportation. A century later, railroads connected the country, but even then traveling across states, or to distant parts of the globe, was a matter of days and weeks. Now, the president can travel to any country in a matter of hours aboard the comfortable Air Force One. This has fostered an even greater role for the president in foreign affairs. Presidents can now meet face-to-face with foreign leaders as needed. This ease of transportation has furthered the notoriety of presidents on a global scale previously impossible. However, the main thrust of this thesis relates to how modern communications technologies have transformed the presidency, and more specifically, how they’ve reshaped the president’s role as the nation’s agenda setter. The first president to truly leverage modern communications technology at the time was of course Franklin Delano Roosevelt. He became famous for his “fireside chats”, a series of conversations FDR broadcast on the radio to the entire nation. He used these chats to explain complex topics—the banking crisis, his New Deal program, the Social Security Act—things few Americans truly grasped. And perhaps even more than this, these chats were used as a shrewd political tool. It allowed FDR to appeal to the people directly, over the heads of people in Congress. As he remarked once to one of his advisors, “All we have to do is to let the flood of mail settle on Congress . . . and the opposition will be beating a path to the White House door.” (Storm 2007). FDR was able to leverage the advent of radio to enlarge the communicative and agenda-setting powers of the presidency. Decades later, a new technology further expanded the President’s communicative powers: television. President Kennedy was the first to use this technology to its full potential (Milkis 2008). JFK is famous for his wit, charm, and exceptional charisma, and it was television that truly allowed his youthful personality to be seen to its fullest extent. Unlike previous presidents who used TV for formal speeches, Kennedy relied on the informal press conference format. He deftly handled questions from reporters, displaying to the American people, “his wit, intellectual sure-footedness, and physical attractiveness.” (Milkis 2008). This allowed Kennedy to appeal directly to the American people and placed public pressure on Congress (Milkis 2008). This shows how television and other forms of mass communication have greatly enhanced the president’s role and capacity as the nation’s agenda setter. Now we have entered into a new era of communication where social media is king. Twitter, Facebook, and YouTube have emerged as powerful tools for political discourse, increasingly used by politicians of every tier. These new tech tools differ in various ways. YouTube’s own algorithms prioritize longer form content, and as many creators will tell you, interaction with the audience (on the platform itself) is a challenge, if not a waste of time entirely. Thus, YouTube is perhaps more similar to traditional media in that there is a lot of talking to someone without too much talking back. Twitter, however, differs greatly in both of these regards. It is inherently short in that every user is limited to a character count not much longer than a text. Furthermore, it’s tools prioritize engagement between users via retweets and tags, differing greatly both from YouTube and traditional media in this regard. Though President Obama was the first president to make significant use of Twitter, @realDonaldTrump has far surpassed @BarackObama in terms of notoriety. His tweets are a frequent topic of discussion and debate, even amongst those who might not use Twitter themselves. The question is: How much power resides within the thumbs of President 45? More specifically, does Twitter provide Donald Trump with the power to set the agenda and guide the national conversation much like FDR and JFK before him? The crux of this thesis relates to Donald Trump’s ability to set the national agenda through his tweeting. Maxwell McCombs and Donald Shaw pioneered the theory of agenda-setting. The essence of their findings was that the public perceived an issue to have greater importance the more it was covered, thus illustrating the significant role of the media in setting the agenda (McCombs 1972). In Scott Adams’ book on Trump, he presents a similar, more generalized rule that the things a person thinks about most will naturally rise in importance in their minds (Adams 2017). This idea is further corroborated in Daniel Kahneman and Amos Tversky’s seminal research on cognitive biases experienced by humans. In Kahneman’s New York Times best-selling book, Thinking, Fast and Slow, he explores a number of cognitive biases, namely the availability heuristic. The basic idea is that the easier it is to retrieve instances of an event from memory, the more likely you are to perceive that event as occurring often. For example, after Parkland, many parents were fearful about leaving their kids in school but simultaneously had no fears driving their kids to school. Statistically, this does not hold. The odds of getting into a car accident are substantially higher than being involved in a school shooting, and rationally, one would be more afraid of the former. However, because the tragic event in Parkland was readily available in people’s minds, the risk feels higher. This can lead to the availability cascade, in which the public’s emotional reaction to an issue then promotes more coverage of that issue, further compounding the distorted perception (Kahneman 2011). In short, all of this research leads to the conclusion that the stories emphasized by the media tend to be perceived as being more important or more regular because they are more readily available in a person’s mind. The question has now become whether or not this theory of agenda-setting proposed by McCombs and Shaw holds true with the advent of new media (Matei 2010). Based on more recent research, it stands to reason that the same psychological biases would still be at play. Further, new media and old media cannot be neatly separated. An article published in Computer-Mediated Communication found that Twitter and new media as a whole has a symbiotic relationship with traditional media (Conway 2015). That is to say that in some instances, new media simply circulated what was published by traditional media outlets, whereas in other instances Twitter shaped/predicted traditional news coverage. In the realm of academia, Twitter is referred to as a “microblogging” site. Contrary to a traditional blog, users are limited to 140 characters to convey their message (now expanded to 280 characters as of Nov. 7th, 2017). Though there are ways of skirting around this rule, such as the barrage-of-tweets technique President 45 often employs, the basic concept remains. Keep it concise. The essential metrics tracked on Twitter are mentions (when one user makes reference to another), retweets (when one user sends another user’s tweet to their own followers), replies (which create a thread local to that tweet—generally referred to as a conversation), favorites, followers, and followees. Mentions and retweets are most often used to measure influence as both propagate the original user or tweet. The number of followers of a user is used to measure popularity. In the Twitterature (literature on Twitter) there is widespread concurrence that a small subset of active Twitterers influence the vast majority of Twitter users (Cha 2010; Goyal 2010; Tumasjan 2010; Zhang 2017). Notably, this tendency for a small subset of a population to influence the rest is not relegated to Twitter and is the focus of the oft cited book, The Influentials: One American in Ten Tells the Other Nine How to Vote (Keller 2003). These powerful nodes in Twitter are often referred to in viral marketing, the goal being to target these influential hubs to generate virality with minimal effort (Tang 2009). Interestingly, a Twitterer with high indegree (popularity, number of followers) is not highly correlated with having high influence, as measured in terms of retweets and mentions (Leavitt 2009; Cha 2010). CNN, for example, has nearly double the follower account of Mashable, but appears to have far less influence (Leavitt 2009). Additionally, influence can be consciously generated by focusing tweets on a single topic (Cha 2010). A relevant, anecdotal example of this is Scott Adams. In the early stages of the 2016 election cycle, he had 15,000 Twitter followers and was known for creating the Dilbert comic strip. Two years of Trump-focused tweets later and he is approaching 250,000 Twitter followers, and has now published a book on Trump (Adams 2016). Assuredly there were other variables that impacted this rise in follower count, but nonetheless it is a case leading to the same conclusion as the research: focusing on a single topic facilitates influence amongst those who have an interest in that topic. Another study authored by Watkins suggests that, “usefulness of information can have a significant influence on engagement” (Watkins 2017). There are myriad ways this all relates to @realDonaldTrump. The first is that President Trump would be classified by the literature as a node. That is to say, due to his massive follower count (51.7 million followers, up from approximately 44 million followers when this research began), tweets from the President reach a vast audience on Twitter. That audience is then able to retweet those tweets, thereby spreading the reach of Mr. Trump’s Twitter even further. Additionally, as will be expounded upon later, Mr. Trump tends to tweet about the same topics relentlessly, something the literature prescribes for increasing influence. For example, tweets about healthcare, tax cuts, and North Korea take up a large portion of Trump’s tweeting, vastly outnumbering his tweets on many other issues. And finally, as Mr. Trump is now President of the United States, he has access to more information than virtually every other person on Twitter. Thus, he has a uniquely unparalleled ability to break news, another prescription for generating influence. These three factors together radically increase Mr. Trump’s presence on Twitter. This is all critically important because, as previously mentioned, Twitter has a symbiotic relationship with traditional media. Sometimes traditional news outlets precede conversations on Twitter, and other times Twitter shapes what traditional outlets cover. It stands to reason that the stronger President Trump’s presence on Twitter is, the greater probability there is of his tweets influencing traditional news coverage and thereby shaping the national agenda, and further, what people consider to be important. Preliminary studies suggest Trump’s Twitter is in fact a part of the conversation in traditional media. Pew Research Center found that 16% of news stories that were written in Trump’s first 100 days included one of his tweets (Grieco 2017). They also found that stories containing a Trump tweet were 12% more likely to be negative. A better question is: How many of those stories were generated because of an @realDonaldTrump tweet? Trump believes, “Good publicity is preferable to bad, but from a bottom-line perspective, bad publicity is sometimes better than no publicity at all. Controversy, in short, sells.” (Trump 1987). Given this perspective, alongside the classical literature by McCombs and Shaw, it might explain why President 45 continually defies calls to stop tweeting (Shepard 2017). He might view it as a means of generating media coverage (good or bad) and directing the conversation. The focus of this thesis is to determine if that view is valid. How does one measure how much news coverage a tweet (or tweets) generates? Various approaches are possible. This study focuses on the number references to a particular topic in the media before and after an @realDonaldTrump tweet regarding that topic: Does a tweet by Donald Trump on topic X lead to more coverage of topic X, less coverage of topic X, or no change in the coverage of topic X? Methods for determining this will vary by media type. Once the tweets were imported into an Excel spreadsheet, a first reading was completed. This involved reading through all 2,599 of the tweets collected from 2017 and sorting them into preliminary categories. Often these categories were not the final category into which the tweet was sorted but acted as a quick reference for secondary and tertiary readings. For example, on November 12th, 2017, Donald Trump tweeted: “Why would Kim Jong-un insult me by calling me ‘old’ when I would NEVER call him ‘short and fat?’ Oh well I try so hard to be his friend – and maybe someday that will happen!” This tweet was then sorted into the category of “North Korea” with the supplemental tag of “Kim Jong-un”. This process of categorization was conducted for every tweet. The general purpose of this was to get a better understanding of Trump’s Twitter patterns in 2017. This helped to illuminate what issues the President tweeted about most, what issues the President tweeted about only on rare occasions, and what issues the President tweeted about might work well as cases for further analysis. From this, a number of general observations were made which had yet to be formally examined and will be further discussed in later sections. An example of one such observation is that a substantial percentage of Donald Trump’s tweets are fairly innocuous and simply give updates on his travels, with whom he’s met, or refer to generic events such as Thanksgiving or other national holidays. The primary purpose in breaking down Donald Trump’s tweets into issue categories is to determine on which issues the President places an emphasis via Twitter, and whether or not media outlets follow suit. In other words, if the President were to tweet repeatedly about the need for a wall along the southern border, do those tweets then translate into media coverage about the prospect of a border wall? As previously discussed, how much attention the media dedicates to an issue significantly impacts people’s perception of the importance of that issue. Whether or not an issue was selected for further analysis depended on a variety of factors. One such factor is whether or not there was a tweet of origin. For the purposes of this research, a tweet of origin is defined as a tweet on a particular topic (e.g. North Korea, the wall, the travel ban) about which the President had not tweeted for at least 30 days prior to the tweet in question. The rationale for this relates to tracking coverage in the media. If there is a clear origin tweet from @realDonaldTrump, it becomes easier to distinguish between media coverage before and after the tweet. If, however, one were to select a tweet at random on a topic about which the President might have already tweeted, it is possible that media coverage might have already been spurred by a previous tweet, thus making it appear as if a later tweet had only a limited impact. It is for this reason that the cases which were ultimately selected tended to have a “beginning” tweet and an “end” tweet. For example, with the NFL national anthem issue category, there is a clear first tweet from @realDonaldTrump and last tweet from @realDonaldTump on the issue. In short, a tweet of origin makes it easier to create a before and after picture. Another factor that determined whether or not an issue category was selected for further analysis was the ability for it to be tracked in the media. The way media coverage was tracked was relatively straightforward and simple. Each issue was assigned a specific tag. This tag represents a phrase directly associated with the issue that would be difficult for anyone to avoid using when discussing said issue. For example, when people in the media discuss the issue of nuclear weapons on the Korean peninsula, it would be difficult, if not nonsensical, to avoid the phrase “North Korea”. With such a broad tag you of course also run the risk of including media references that discuss North Korea, but not necessarily the issue of denuclearization specifically. The limits or drawbacks of each specific tag will be discussed in their respective sections. Certain issues the President tweeted about were better suited for an effective tag. For example, in late October, President Trump tweeted out about the #JFKFiles. The phrase “JFK Files” is not something that comes up in regular conversation, nor is it very likely that that term would be used to describe anything other than files to be released regarding John F. Kennedy. Therefore, it stands to reason that media references which include the phrase “JFK Files” are in reference to the files themselves. As an alternative example, Donald Trump tweeted on occasion about manufacturing in the US. However, the phrase “manufacturing” can be used in a variety of circumstances, not just in reference to factories that create products. Thus, that would be a difficult issue to track in the media with the tag search method being implemented. The basic idea of the tag-search method is to count the number of occurrences of a particular phrase in the media. The method for counting these occurrences varied by media type. For television news, the website archive.org was used. Archive.org allows you to search TV news captions for any desired phrase. Their data sets include a vast array of networks, and all of the major cable news networks—CNN, Fox News, MSNBC, and so on. The results from archive.org, which display a thumbnail of the broadcasts that included the searched phrase, can be sorted by date and limited to a specific range. The number occurrence of that tag on each day were then counted using the “Command-F” function and input into an Excel spreadsheet. A similar process was used for print journalism, which included articles from The New York Times and The Washington Post. In these cases, the advanced search engines on each of their respective websites was used, similarly searching for a tag, limiting the date range, counting the number of articles written for each day within the range, and inputting the results into an Excel spreadsheet. A separate Excel spreadsheet was created for each issue. Every tweet on a selected issue was input into this spreadsheet, along with all of the relevant data (tweet text, date, retweet count, like count, tweet ID, category, and tags). The date range depended on the specific tag in question, but generally included at least 30 days of coverage before the tweet of origin, and 30 days of coverage after the tweet of origin. A table was then created with four columns: one for the day of the month, one for the number of tweets on a particular issue from @realDonaldTrump, one for the number of references to that issue on TV news, and one for the number of references to that issue in print journalism. 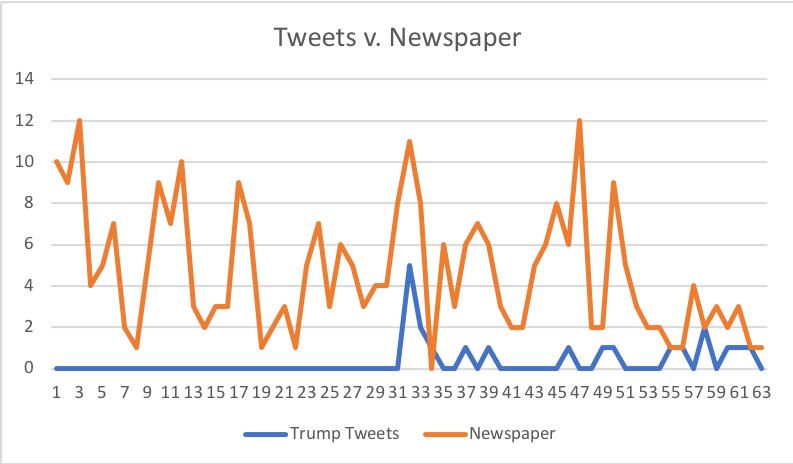 The purpose of this is to see whether or not there is a correlation between President Trump’s tweets on an issue and increased coverage of that issue during the same timeframe. The reason for having a longer timeframe is twofold. First, due to the President’s tweets being posted at irregular times, the window of coverage analyzed must at least be in length of 24 hours in order to account for every TV news program. In other words, if President Trump were to tweet out at 9:34 pm, and then one were only to look at news coverage on that day, it would not be representative of the total coverage that tweet may or may not have generated as it would exclude programs which aired prior to the 9:34 pm tweet time. The second reason a larger window of coverage was selected was to see whether or not tweets from President Trump generated sustained, elevated coverage of an issue. In other words, if President Trump were to tweet about Kate’s Law, does that tweet coincide with an immediate spike in coverage, or increased coverage of the issue for days/weeks after. This is to determine if the effects of President Trump’s tweeting (such that there are any) are longer term in nature. Once all of the data from the various sources were input into this table from the selected timeframe, two graphs were then created. These graphs represent the number of tweets on an issue from @realDonald Trump vs. the number of mentions in TV news, and the number of tweets on an issue from @realDonaldTrump vs. the number of mentions in print media. References to the issue on TV news and in print media were graphed on separate Y axis so as to better visualize any possible correlations. The final issues selected for further analysis were the NFL protests during the National Anthem, the JFK files released October of 2017, the immigration-related bill “Kate’s Law”, the wiretapping accusations made by President Trump against President Obama, and finally the issue of so-called “fake news” in America. These issues were selected for a variety of reasons. For one, they are diverse in nature. Some relate to legislation (Kate’s Law), others to the relationship between new media and traditional media (fake news), and others to announcements about a future executive action (JFK files). Secondly, they all were tweeted about by President Trump on multiple occasions across an extended period of time (i.e. beyond one day) so as to be able to track correlation across time. Third, as discussed above, these issues had a distinct tweet of origin and were unique enough to have specific tags created that would reliably represent references to the issue in the media. Other factors were also considered but shall not be enumerated here. All of this amounts to an overview of how this study was conducted. Specific analysis of the data, as well as any deviations from this script will be discussed in later sections. My expectation is that much like the relationship between Twitter and traditional media as a whole, the relationship will be symbiotic. In some instances, a tweet by @realDonaldTrump on a particular topic will lead to a dramatic increase in coverage of that topic. In other instances, I expect a tweet by @realDonaldTrump will be in reaction to preexisting coverage and therefore have no impact on the amount of coverage on that topic. I will know this expectation is wrong if there is no instance where an @realDonaldTrump tweet on a particular topic is followed by an increase of coverage on that topic. This expectation would also prove wrong if every @realDonaldTrump tweet is followed by an increase in coverage on a given topic. If this expectation, however, proves to be true, President Trump has an unprecedented ability to guide the national agenda 280 characters at a time. Beginning in 2016, Colin Kaepernick, a former starting quarterback for the San Francisco 49ers and notorious bad luck charm for fantasy football teams, started a protest. His protest was simple, peaceful. Before every game, as the National Anthem echoed throughout Levi Stadium, Mr. Kaepernick took a knee. As others stood and placed their hands on their hearts in honor of their country, Mr. Kaepernick knelt. When asked why, he said, “I am not going to stand up to show pride in a flag for a country that oppresses black people and people of color” (Newkirk 2017). Going hand in hand with the Black Lives Matter movement, Mr. Kaepernick believed it was necessary to speak up through peaceful protest and elevate the voices of people of color throughout the nation. Many owners within the NFL were not happy with Mr. Kaepernick’s protest. Whether it was because they didn’t like the statement he was making, thought he was detracting from the game, or simply thought he was eating into their bottom line, the higher ups in the NFL were no fan of Mr. Kaepernick. This has led many to speculate that his role as a bench warmer is a product of his protest, not his athletic ability as ought to be the case. However, despite the tensions within the NFL, and Kaepernick’s diminished role as a pro-athlete, the issue itself had begun to fade. That is, until September of 2017. Furthermore, across the entire date range, there is a correlation of 0.84 between Trump’s tweets and TV news coverage, and a correlation of 0.51 between Trump’s tweets and articles published. 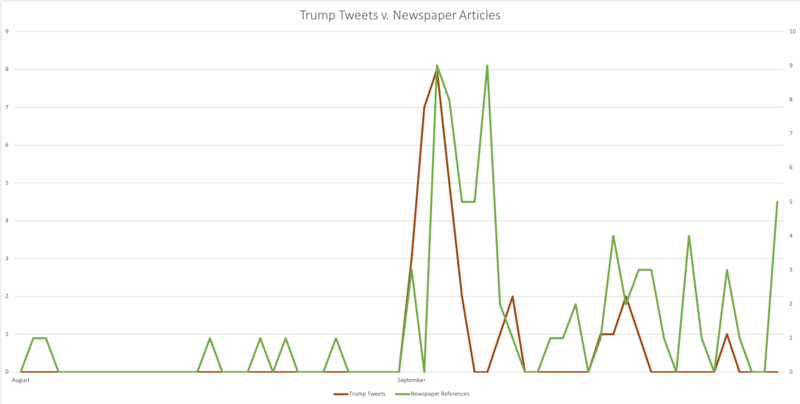 Note that a high correlation suggests not only that Trump’s tweet of origin might have spurred a spike in news coverage, but that all future spikes in coverages coincided with a tweet from @realDonaldTrump. This chart (Figure 1, Figure 2) and the aforementioned spikes in coverage would lead one to speculate that as it relates to the NFL kneeling protests, Trump’s tweeting has had a dramatic impact on coverage of the issue. And indeed, as the initial tweets seem to closely precede the spikes in new coverage, that appears to be the case. And not only that, but that news coverage of the issue (specifically on television) was sustained through further tweeting by the President. It is worth noting, however, that President Trump did not begin this conversation. If anyone did, it would be Mr. Kaepernick. There were articles and news broadcasts on the issue which preceded Mr. Trump’s tweet of origin. But, Mr. Trump’s tweeting on the issue also appears to have magnified that coverage dramatically. As an interesting addendum to this section, which ought to require more investigation in and of itself, President Trump’s tweets on the issue of the NFL’s kneeling protests appear to have had an impact beyond just simple attention. An article published in Vox found that in the wake of Trump’s twitter attacks targeting the NFL, the NFL’s favorability as a brand fell from 30% to 17%—nearly a 50% decrease (Lopez 2017). Morning Consult, an online survey and market research company on which Vox relied for their article was gracious enough to give temporary access to their data for this thesis. And indeed, coinciding with Donald Trump’s tweets attacking the NFL, there was a spike in “Very Unfavorable” views of the NFL, specifically from people who supported Donald Trump in the 2016 election (see Figure 3). Interestingly, the “Very Unfavorable” percentile rose from roughly 12.5% to 37.5% and has remained steady at that newfound level of favorability going into late November. This suggests that not only did President Trump’s tweets on the NFL spur some distaste toward the league amongst his base, but that that distaste has continued past the media’s heightened focus on the issue. A note on the “nfl kneeling” tag: It is possible that this tag excluded some references to the issue in which that specific phrase was not used. However, a more generic tag such as “nfl protest” might have conversely included additional media references not necessarily in direct relation to the issue of taking a knee during the National Anthem. It is for this reason that the tag “nfl kneeling” was selected. The assassination of John F. Kennedy is one of the most noteworthy moments in American history. Even today, decades after the event, it still captures the imagination of millions of Americans. The Zapruder film, which shows the assassination itself in graphic detail, has over 18 million views on YouTube, and counting. Perhaps this is because this was one of the first national crises to be broadcast on television throughout the country. Perhaps it is because JFK is the only president in living memory to have been assassinated. Or perhaps it is because there is much that still remains a mystery about the event itself. The circumstances which surround JFK’s assassination are somewhat curious, even to the most pragmatic of people. Who was Jack Ruby? Was there a second shooter on the grassy knoll? Was the CIA involved in his assassination? How plausible is the so-called “Magic Bullet” theory? Though there have been no shortage of books and documentaries analyzing the event, many questions remain unanswered. JFK’s assassination is jet fuel for conspiracy theorists, perhaps because it sparks curiosity amongst the most sensible of people. Given this widespread public curiosity regarding JFK’s assassination, it is not surprising that many folks would be dying for the release of the JFK files—thousands of documents classified to the public related to the assassination. This brings us to October 21st, 2017, the day Donald Trump tweeted, “Subject to the receipt of further information I will be allowing as President the long blocked and classified JFK FILES to be opened.” The release of these files is in line with a law which required the release of these files after 25 years. In the 30 days preceding Trump’s tweet on the “jfk files”—this was the tag used for search queries—there were 4 television broadcasts which made reference to the files, and 0 articles published in the two newspapers used for this research. In the 30 days following Trump’s tweet on the “jfk files” (inclusive), there were 314 television broadcasts which made reference to the files, and 8 articles published which did the same. Further, across the entire date range, there is a correlation of 0.44 Trump’s tweets and TV news coverage, and a correlation of 0.18 between Trump’s tweets and articles published. These results suggest that unlike the NFL, while Trump’s initial tweet might have spurred coverage of the issue, further coverage of the files was less closely related to @realDonaldTrump. However, throughout the 60-day period examined, there are only 19 broadcasts/articles (of a total 326) that took place more than 24 hours before Trump’s first tweet on the issue, or 24 hours after Trump’s last tweet on the issue. In other words, the vast majority of broadcasts/articles occurred during the eight-day window of Trump’s tweeting on the issue (an eight-day timeframe). Interestingly, there is a stark difference between the kinds of tweets Mr. Trump released on the JFK files, and the kind of tweets Mr. Trump sent out about the NFL. The micro blogs Trump tweeted in regard to the NFL protests were emotionally charged and tended to offer his opinion on the matter. Conversely, the President’s tweeting in regard to the JFK files could be classified as more of an announcement. He was notifying his followers of his intention to release the JFK files and in essence breaking news. In the 30 days prior to President Trump’s tweeting about “kates law”, there were 39 television broadcasts which made reference to the issue, and 0 articles published in The New York Times or The Washington Post. In the 30 days after President Trump’s tweet about Kate’s law, there were 65 television broadcasts and 4 articles published that reference the issue. This would seem to indicate that, as with some of the past issues explored, President Trump’s tweets were followed by increased news coverage to some degree. However, unlike the other issues discussed, and as is apparently visible in the graphs, spikes in news coverage on Kate’s Law, and spikes in Donald Trump tweeting about Kate’s law do not overlap. That is to say that they do not occur within 24 hours of each other, which would seem to indicate a correlation. And indeed, the correlation for Kate’s Law was calculated at -0.04 for @realDonaldTrump tweets in relation to TV news coverage. However, the correlation was significantly higher for @realDonaldTrump tweets with respect to print journalism, calculated at 0.56. A better explanation for this discrepancy might be that, as can be garnered from President Trump’s tweets, he tweeted only in close proximity to a vote on the bill taking place in Congress, which may also be when outlets like The New York Times and The Washington Post are most likely to reference the issue. There is no shortage of statements Donald Trump has made that have prompted fact- checkers’ heads to spin. There was the time he casually accused Ted Cruz’s father of being involved in the JFK assassination, the time he claimed he won one of the biggest electoral landslides in history, the time he said he’s signed more legislation than any president before him, and so on. Even ardent Trump supporters would do well to admit that, at best, Mr. Trump has a tendency to be hyperbolic. As Anthony Scaramucci, a longtime acquaintance and short-time employee of President Trump once said, “the president doesn’t let the truth get in the way of a good story.” (Karem 2018). In this regard, many pundits accused the President of going a bridge too far when, on March 4th, 2017, President Trump tweeted, “Terrible! Just found out that Obama had my ‘wires tapped’ in Trump Tower just before the victory. Nothing found. This is McCarthyism!” The President was immediately rebuked by many for offering no evidence to support his claim. However, as President Trump would say, “Controversy, in short, sells.” (Trump 1987). In the 30 days preceding President Trump’s tweet, there were 29 TV broadcasts which referenced “obama surveillance”, and 0 articles published in The New York Times or The Washington Post referencing “obama surveillance” (see note on tag at the end). In the 30 days after President Trump’s tweet, there were 1,051 television broadcasts that made reference to the issue, and 56 articles written on the issue. 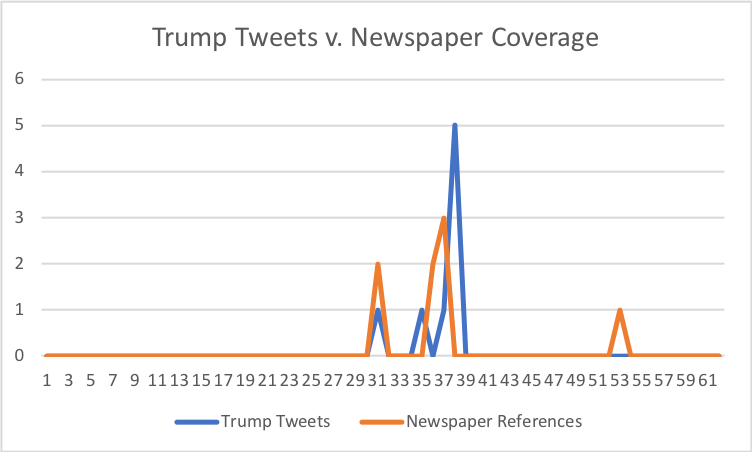 However, the correlation between Trump’s tweets and coverage in either type of media was virtually non-existent, calculated at 0.19 vs. newspapers, and 0.23 vs. TV news. As seen in the graphs, coverage remained remarkably high after the tweet of origin. This suggests that while Trump’s initial tweet might have instigated the coverage, further coverage was motivated by other factors. A note on the “obama surveillance” tag: as discovered when sifting through articles containing the phrase “obama surveillance”, some were not in direct reference to Trump’s wiretapping claim. These were excluded from the count. However, the magnitude of references in TV news made such exclusion impossible. Therefore, a statistically insignificant number of TV news references to “obama surveillance” are likely not a reference to Trump’s wiretapping claim. It’s no secret large swaths of Americans have little faith in the news media at large. A Harvard-Harris poll published last year found that, “65 percent of voters believe there is a lot of fake news in the mainstream media.” (Easley 2017). In other words, the majority of Americans are not sure they can trust the news they are watching and reading. In a republic that in part relies on an educated populace, having access to quality information is essential. If the people cannot trust the information they are given, that is a problem. Further compounding the problem of trust in media is President Trump himself who routinely attacks any news outlet that dares to deride him. Presidents fighting with the press is nothing new of course. It dates all the way back to our founding. George Washington saw himself as a unifier and despised the factionalism newspapers promoted, going as far as to cancel his subscriptions to 30 newspapers just prior to taking office. John Adams went further with the (quickly repealed) Alien and Sedition Acts which made it a criminal offense to be critical of the federal government. Still, President Trump’s relentless attacks on the media are unique both in how apparent they are to the public and how often they occur. One of the interesting things discovered in conducting this study is that throughout 2017, Donald Trump tweeted an attack on the media 268 times. Those 268 media attack tweets represent over ten percent of the total tweets Trump sent out in 2017. 175 of those 268 tweets included the phrase “fake news”, which Trump first tweeted in late 2017. The tweet of origin selected for this category was published on January 11th, 2017 and read, “FAKE NEWS – A TOTAL POLITICAL WITCH HUNT!” In the thirty days preceding this tweet from @realDonaldTrump, there were 1,027 references to the phrase “fake news” on TV news, and 160 references in print. In the thirty days after the tweet from @realDonaldTrump, there were 1,699 references to the phrase “fake news” on TV news, and 133 references to the phrase in print. Interestingly, this is the first time that there was a dip in coverage in either medium after a tweet from @realDonaldTrump. Across the entire 60-day period, the correlation between Trump’s tweets including the phrase “fake news” and TV broadcasts including the phrase “fake news” was calculated at 0.65. 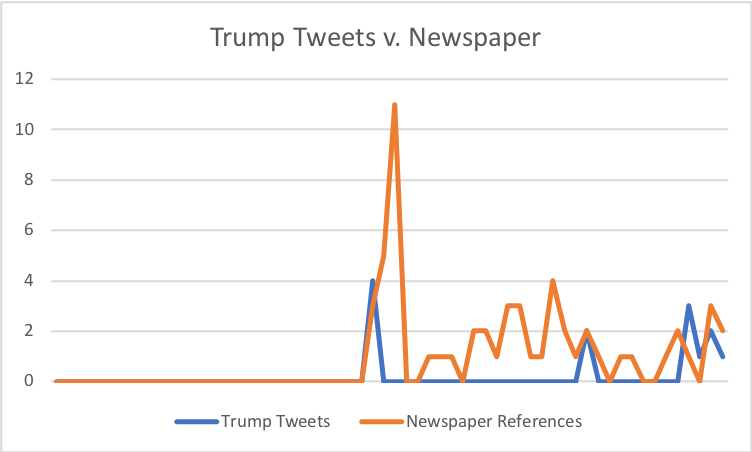 The correlation was significantly lower when looking at Trump’s tweets vs. print news, which was calculated at 0.13. This category differs from others in that it is more reflective of how Trump’s favorite catch phrases infiltrate the news media rather than how he can direct attention toward a specific topic. Nevertheless, he is attempting direct attention toward what he views as a corrupt and dishonest media through his tweeting. And judging from these results, it would indicate that TV news is more responsive to his attacks than print. Unfortunately, due to time constraints, I was not able to complete a full categorization of President Trump’s tweeting in 2017. 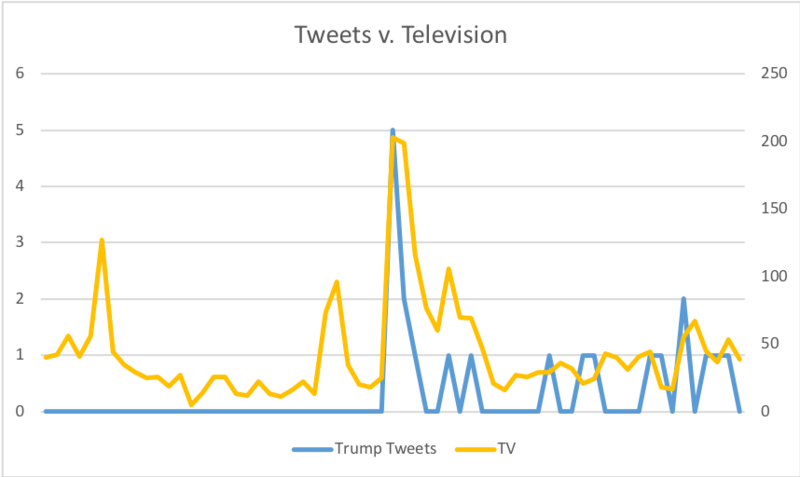 That said, in the data I was able to analyze, some interesting observations arose regarding President Trump’s general tweeting habits. The first is that a large portion of Trump’s tweets are rather innocuous. These are tweets about events like Christmas or Thanksgiving, travel updates such as when the President will arrive or is leaving a country, congratulations to sports teams like the New England Patriots for their victories, and so on. Altogether there were 607 tweets that were grouped into this category, accounting for 23% of Trump’s total tweet count. Another observation is that there are a handful of topics which occupy a large share of Trump’s tweeting. These issues are predominantly the economy (jobs, manufacturing, consumer optimism), the Russia investigation, North Korean denuclearization, attacks on the media, healthcare reform, and the tax cuts passed late last year. As previously mentioned, attacks on the media account for the largest share, representing 10 percent of all of Trump’s tweets. This is followed by 153 tweets on the economy accounting for 6 percent of Trump’s tweeting, and then 138 tweets regarding tax cuts/reform, accounting for 5 percent of Trump’s tweeting. While only tangentially related to the main thrust of this thesis, it is worth noting the impact of Donald Trump’s tweeting on the stock market. An article published by CNBC found that on average, an attack tweet by Trump results in a, “negative 1.2 percent move in the targeted company’s stock price”, whereas a supportive Tweet, “generated an immediate short-term 1.1 percent move higher” (Javers 2017). The emphasis here ought to be on ‘short-term’. Taking Amazon as an example, while Trump’s attacks did have a negative short-term impact, they do not appear to have had any lasting impact on the company’s stock, which is up significantly. (http://www.nasdaq.com/symbol/amzn/real-time). Each of the cases examined above yielded both interesting and varied results. President Trump’s influence on traditional media via Twitter appeared strongest with the issue of the NFL National Anthem protests. Not only was there a stark difference in coverage before and after his first tweet, the correlation for both TV and print was high at 0.84 and 0.51 respectively. Conversely, when looking at directing attention toward Kate’s Law, his influence appeared to be far less significant, particularly with relation to TV news. And distinct from both of these cases was the issue of Obama’s alleged wire tapping of Trump, in which his tweet appeared to precede a dramatic spike in coverage on the issue, but the correlation was no higher than .23 in either medium. So, what differs between these cases? Well, one possibility for why the President’s influence was ostensibly lacking on the issue of Kate’s Law is simply that his tweeting on the subject was not as extensive as any other issue. Only seven tweets were released in relation to Kate’s Law, whereas 13 were released regarding the wiretapping allegation, and 38 were released regarding the NFL protests. However, a single or short string of tweets from @realDonaldTrump appeared to have a dramatic impact on news coverage with other issues. In every case and across both mediums with one exception, there was an uptick in news coverage after Trump’s tweeting on the issue. In many cases, specifically with the NFL protests, the Obama wiretapping claims, the JFK files, and the issue of “fake news” (with television specifically), the spikes in coverage were both immediate (within 24 hours of the tweet of origin) and dramatic. Looking at the three days of coverage before Trump’s tweet on these issues vs. after Trump’s tweet on these issue, the percentage increase in news coverage on the issue was 822 percent on the low end (“fake news”) and 17,900 percent on the high end (“obama surveillance”). This is a significant increase in news coverage post-tweet. Still, the question remains as to why the results differed from case to case. Perhaps the answer lies in how online media itself spreads. A recent study conducted by Jonah Berger and Katherine Milkman found that content which evokes “high arousal emotions” is the most likely to be shared (Berger 2011). First and foremost amongst these emotions is anger. President Trump’s tweets on Kate’s Law had no emotional charge themselves, and would only evoke an emotional response from those familiar with the bill, presumably a relatively small portion of the populace. His tweets on the NFL, however, expressed anger themselves (which the aforementioned study found also positively impacts virality), and no doubt the prospect of people refusing to stand for the National Anthem angered those within Trump’s base. Similarly, with the issue of Obama’s alleged wiretapping, the tweets expressed anger themselves, imagining President Obama committing such an act angered those within Trump’s base, and the fact that President Trump made such an egregious claim quite clearly angered those on the left. However, with the JFK Files, Trump’s tweets were not emotionally charged, but they did appear to generate coverage. This does not necessarily contradict the previously cited study, however. Berger and Milkman found that secondary to anger was awe (the inverse of anger, high-arousal positive) in terms of increasing the odds of virality (Berger 2011). And one step below awe was interest. As previously discussed in the “JFK Files” section, there is something about JFK’s assassination that is immensely fascinating (interesting, evoking awe) to large swaths of the public. Thus, perhaps the answer is simply that the traditional media at large is susceptible to the same emotional triggers individuals face on the Internet every day, and because President Trump is such an inherently important figure with a large following on new media, ignoring his voice is virtually impossible. A study published in 2018 by Pew Research Center found that only 50% of adults in the US get their news regularly from television (Matsa 2018). That number is down from 57% in the year prior. Studies like this have led many to the conclusion that the influence of traditional media is dying. Following this, one may question why both print and TV news were essentially used as a barometer to determine President Trump’s influence on a newer medium, Twitter. In response, I would say that this study is framed through the lens of presidential agenda setting. At present, Americans still receive their news from more traditional outlets like TV and print, as well as new media such as Twitter. President Trump’s influence in the Twittersphere is already fairly evident going simply off his follower count and the number of likes/retweets his tweets average. Less clear is his ability to use new media (Twitter) to influence traditional media, and thereby expand his ability to guide the national conversation. In short, because traditional mediums are still relevant and millions of Americans still pay attention to them, they are still a critical component of President Trump’s agenda-setting capabilities. As discussed at greater length in the section on methodology, much of the data collection and analysis required for this thesis was done manually. For example, the data collected from archive.org was collected by counting the number of instances a particular topic was referenced on each day and marking the count into an Excel spreadsheet. As another example, each tweet by @realDonaldTrump was read and organized into a category or sorted with a tag. In both of these cases, and in many others, there is always room for human error. Though the tweets were read through multiple times and certain keywords were searched to ensure proper categorization, there is always the possibility of a tweet being categorized improperly. A way to ensure the reliability of this study would have been to have a separate individual categorize the tweets independently from myself to see if the categories then matched up after separate analysis. However, due to time and financial limitations, this was not feasible for this study. This thesis did not examine the relationship between the number of likes and/or favorites a tweet or series of tweets earned and the amount of coverage an issue received. An important question that warrants further investigation is whether or not tweets that were more popular within the Twittersphere earned more attention from print and television media. Based on the aforementioned research on Twitter, it would stand to reason that President Trump’s most popular tweets would be the most likely to garner attention from traditional media. However, it would be difficult to avoid the directionality issue, i.e., whether or not more favorites/likes leads to increased coverage in traditional media, or increased coverage in traditional media leads to more favorites/likes. Because likes and retweets do not have a timestamp, one cannot determine whether or not news coverage occurred before or after the tweet received the majority of its likes and retweets. Furthermore, it is likely that TV coverage and likes/retweets occurred simultaneously, further complicating the issue of directionality. This research relied on data collected on archive.org’s “TV News” section. This section only includes data from news outlets and does not count networks such as Comedy Central or TBS. It would be interesting to examine whether or not non-news outlets such as these were similarly impacted. My hypothesis is that outlets which include commentary on the news (programs such as The Daily Show or The Late Show with Stephen Colbert) would show similar results as their content tends to be reactionary to the news networks included in this study. This research did not take in to account how many times a tweet by @realDonaldTrump was quoted directly. Anecdotally, I recall seeing screenshots of Trump’s tweets virtually every morning on CNN. It would be interesting—and perhaps further research should examine—what percentage of news coverage on each of the cases explored above was a direct quote of President Trump’s twitter. This would help to better illustrate the full extent of the President’s contribution to a national conversation via Twitter. This could perhaps be at least partially accomplished by tracking how often Trump-specific language is included in broadcasts and print. For example, it would be interesting to know how often a phrase like the “Failing New York Times” or “Crooked Hillary” is referenced as an indicator of how much Trump’s language is used. The results discussed above would seem to indicate that @realDonaldTrump has a significant impact on news coverage both on television and in print, though less so with the latter. In the vast majority of cases, President Trump’s first tweet on an issue preceded an often dramatic increase in coverage, with spikes as high as 17,900 percent. However, while Trump’s initial tweet appears to have often ignited coverage, subsequent tweets on the same issue only correlated with increased coverage in some instances, most notably with the NFL protests. Nevertheless, this research indicates that President Trump is able to leverage Twitter to direct the focus of media attention toward specific issues, thereby increasing their importance in the minds of the public and facilitating his own ability to set the national agenda, 280 characters at a time. Adams, S. (2017). Win Bigly: Persuasion in a World Where Facts Don’t Matter. New York: Penguin. 22. Argensinger, Jo Anne E. (2012). The Fireside Conversations (Review). Pacific Historical Review, vol. 81, no. 1, pp. 111-112., http://www.jstor.org/stable/10.1525/phr.2012.81.1.111. Berger, J., Milkman, K. (2011). What makes online content viral? Journal of Marketing Research, 9. Bollen, J., Mao, H., & Zeng, X. (2011). Twitter mood predicts the stock market. Journal of Computational Science, 2(1), 1. Colleoni, E., Rozza, A., & Arvidsson, A. (2014). Echo chamber or public sphere? predicting Political orientation and measuring political homophily in twitter using big data [Abstract]. Journal of Communication, 64(2) 317. Conway, B. A., Kenski, K., & Wang, D. (2015). The rise of twitter in the political campaign: Seraching for Intermedia agenda-setting effects in the presidential primary. Journal of Computer-Mediated Communication, 20(4), 363. Halberstam, Y., & Knight, B. (2016). Homophily, group size, and the diffusion of political information in social networks: Evidence from twitter [Abstract]. Journal of Public Economics, 143 73. Halford, Ryan (1995). FDR’s Fireside Chats. Presidential Studies Quarterly, vol. 25, no. 1, 1995, pp. 152–154., www.jstor.org/stable/27551391. Himelboim, I., McCreery, S., & Smith, M. (2013). Birds of a feather tweet together: Integrating network and content analyses to examine cross-ideology exposure on twitter. Journal of Computer-Mediated Communication, 18(2), 40. Kahneman, Daniel (2011). Thinking Fast and Slow. New York, NY: Farrar, Straus and Giroux. McCombs, M., & Shaw, D. (1972). THE AGENDA-SETTING FUNCTION OF MASS MEDIA. Public Opinion Quarterly, Volume 36, Issue 2. Pages 176–187. McPherson, M., Smith-Lovin, L., & Cook, J. M. (2001). Birds of a feather: Homophily in social networks. Annual Review of Sociology, 27, 415. Milkis, Sidney M. and Michael Nelson, The American Presidency: Origins and Development, 1776-2014 (Washington, D.C: CQ Press, 2008), 353-380. Page, Anthony and Wilson, Irv, The Missiles of October (United States: Maljack Productions, 1974), Film. Stier, S. (2016). Studying the role of elites in U.S. political twitter debates. 6th Workshop on Making Sense of Microposts, , 43. Storm, Geoffrey (2007). FDR and WGY: The Origins of the Fireside Chats. New York History, vol. 88, no. 2, 2007, pp. 176–197., www.jstor.org/stable/23183311. Trump, D. J., & Schwartz, D. (1987). Trump: The art of the deal. New York: Ballantine Books. Tumasjan, A., Sprenger, T. O., Sanden, P. G., & Welpe, I. M. (2010). Predicting elections with twitter: What 140 characters reveal about political sentiment. Proceedings of the Fourth International AAAI Conference on Weblogs and Social Media. Wainstock, Dennis (1996). The Decision to Drop the Atomic Bomb (Westport, CT: Praeger Publishers, 199), 123. Watkins, B. (2017). Experimenting with dialogue on twitter: An examination of the influence of the dialogic principles on engagement, interaction, and attitude. Public Relations Review, 43(1), 163. Weber, Nicholas P. Archival Issues 21, no. 1 (1996): 89-90. http://www.jstor.org/stable/41101938. Zhang, X., Han, D., Yang, R., & Ziqiao, Z. (2017). Users’ participation and social influence during information spreading on twitter. Plos One.